CAT tool use by translators: what are they using? « Translator T.O. In the previous post (which was post number 100 on this blog), we took a first look at CAT tool use among translators. This week we will delve into this subject some more, examining which tools are being used, how translators are deciding on those tools, favorites, least favorites, and recommendations. And if you are a reader who likes charts and graphs, you’re in luck. You can click on any of the graphics in this post to open a larger version in a new browser tab for easier viewing. Let’s recap on the source of this information. 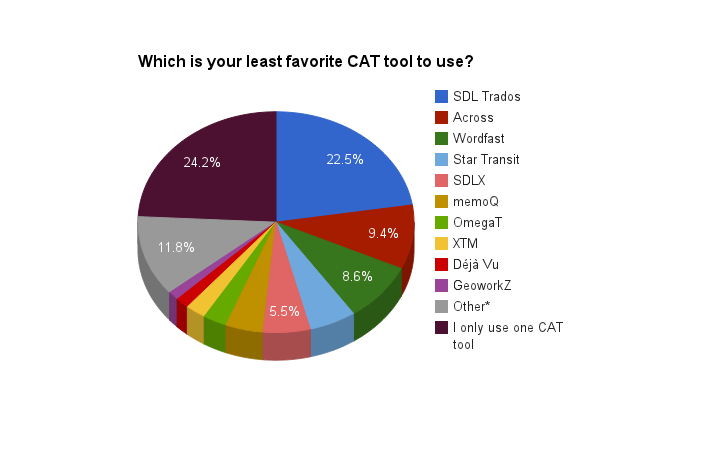 The surveys on CAT tool use were aimed primarily at full-time professional translators. A majority of survey respondents have been in the translation business for at least five years, and just over thirty percent of them have been in the business for more than ten years. The largest age group of survey respondents was between 25 and 35 years old (35%). Over three thousand full-time professional translators from around the world responded to the surveys, which were broken into a survey for CAT tool users and one for those who do not use any CAT tool at all. So, which CAT tools are being used most? Not surprisingly, Trados comes in first, followed by Wordfast and memoQ. 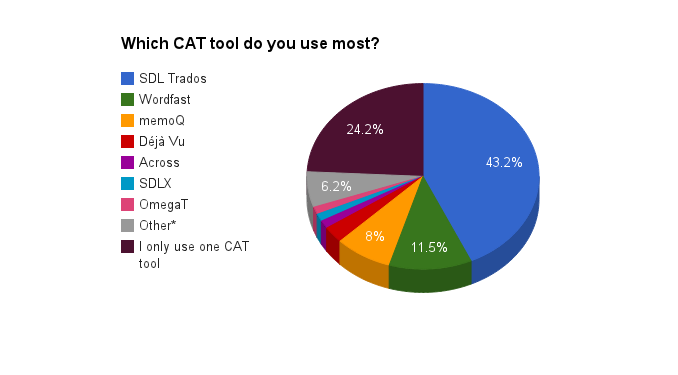 The top three ranking held together when translators were asked to state their favorite CAT tool (in cases where more than one CAT tool was in play– just over 24% of CAT tool users only use one), and which CAT tool they would recommend to someone considering using a CAT tool for the first time. Thirty-three percent of respondents who use a CAT tool own at least one CAT tool they do not use at all. 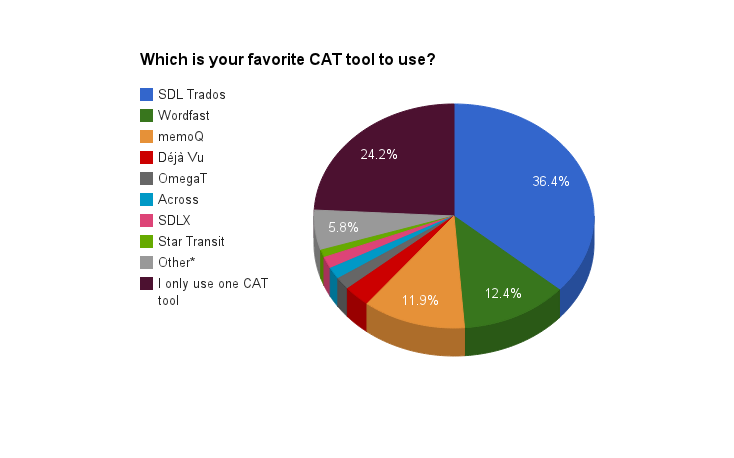 Ninety-three percent of CAT tool users agree that using a CAT tool helps them to translate more efficiently (3% said no, and 4% were not sure). Those who stated a CAT tool had helped in this respect were asked to rate the increase in their efficiency based on the average project for them in their area of expertise. It can be difficult to accurately estimate an increase in efficiency due to one factor alone, but the numbers illustrate some increase overall, with the largest number putting the increase in the 20 to 30 percent range (this is consistent with the findings in a previous State of the translation industry report). Client expectations or requirements ranked highest among the reasons translators chose a particular CAT tool, though some point out that they have clients who do not necessarily specify which CAT tool, but rather expect that one be used. An interesting number were introduced to their primary CAT tool through translation studies or at previous in-house jobs by their employer. Recommendations made by colleagues or friends weighed heavily, and a large number also researched the options available on the market before deciding on which CAT tool to go for. Some respondents who have been working in translation for many years now noted that when they began using a CAT tool, there were few if any options to choose from on the market. Price was a factor but not much of one, tying with “Chance” as a reason for deciding on a particular tool. When it came to highlighting the features that translators looked for when selecting a CAT tool or deciding on a favorite, ease of use of course came in first. Price was again a factor but did not rank highly, though it did beat out tech support/community, available training for the tool, and customization. 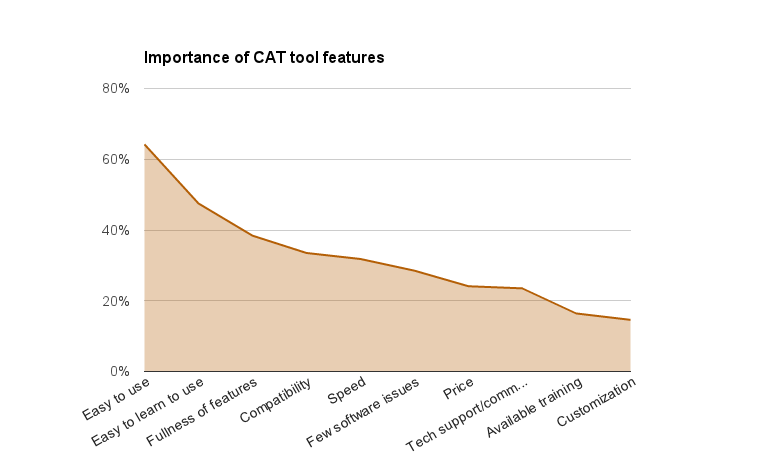 Non-CAT tool users were asked what, if anything, might convince them to start using a CAT tool. Those not using CAT tools may be broken into two groups: translators who have previously used a CAT tool (68%) and those who have never used one (32%). Price did rank highly among reasons here, with many respondents stating that a cheap or free tool or free training in the tool would be a convincing argument. This was followed by the wish for readily available in-depth and usually in-person training in the CAT tool and simpler, easier-to-use interfaces and features. Some would take the plunge with stronger assurances of increased work volume as a result of investing in a tool. Interestingly, among translators not using a CAT tool, many responses seemed to indicate an impression that the use of a CAT tool might be intended as a replacement for a translator’s skill, knowledge and existing quality assurance rather than as an enhancement to these. A concern also often voiced was that of CAT tools as being tied to inherently lower payment for projects. Compatibility with operating systems other than Windows was another roadblock for some respondents. Finally, both groups were given some broad opinions on CAT tools and asked to state which best described their own opinion. Here are the results. CAT tool users: what would you want someone who is studying whether or not to incorporate a CAT tool into their translation work to know? For those not using a CAT tool, are there points not covered here which should be? 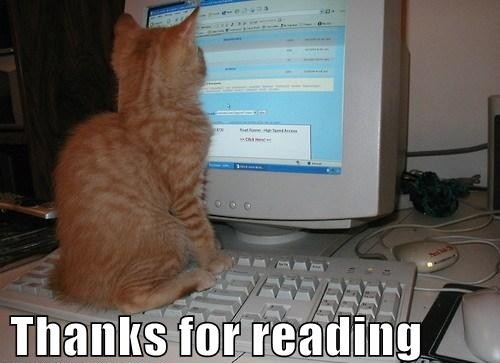 You can view ratings, translator reviews, compare features and download free trials for most CAT tools and other translator software using ProZ.com’s translation software comparison tool. This is part two of a two-part article. You can read part one here. It is an abbreviated version of information which will appear in this year’s State of the industry report for freelance translators. CAT tool use by translators: who is using? Thanks for the feedback, Attila, I’m happy to hear the stats will be useful. Look for more posts like this here on different aspects of translation work throughout the year. Thank you for the post. Nice research. Could you tell me the number of translators(the number of total responses) involved in this survey? Very interesting read. Can you tell us how many respondents this survey included please? I didn’t find the info in the article. Thanks, Jessica, Nick and Tania. There were just over three thousand respondents to the survey. More detailed analysis of this and other trends is being compiled for this year’s State of the industry report for freelance translators. Great post. Deciding on a particular CAT tool to start with is often.a major issue, in particular as a freelancer. Looking forward reading this year’s report! Thanks Ruth! I agree it can be a major issue, and a relatively big investment sometimes too. I hope that tools like the software comparison feature can begin to help those who are on the market for a new CAT tool or other software– reviews from users of those tools will be key in helping to inform others. I’m sorry, but I doubt these statistics are not skewed. Hi Pablo, thanks for the comment. Could you be more specific? For the most part, I’ve presented the numbers directly and tried to keep commentary on them to a minimum, so I don’t feel there is much room for them to appear skewed. Do you have data that would contradict this? Hey Jared, this is a fantastic resource, thanks so much for posting! 1. Which CAT tool do you use? 2. Which CAT tool do you use most? 3. Which is your favorite CAT tool to use? OmegaT and DejaVu’s percentages are too small to be displayed on the graphs, but I would love to use the figures in my project if anyone knows them. Thank you for the very interesting article! I am currently writing an essay on CAT tools and I just wondered if you could tell me where you got the statistics from? They would be very handy evidence for me! Pingback: Large number of CAT tools – is it a problem or a solution?